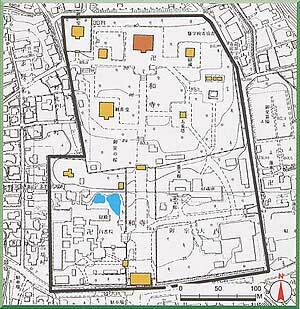 The construction of Ninna-ji was initiated by Imperial command, and was completed in 888 under Emperor Uda. Also called the Omuro Palace, Ninna-ji is the foremost temple of the monzeki tradition, because an imperial son or other member of the imperial family served as the temple's abbot from generation to generation. 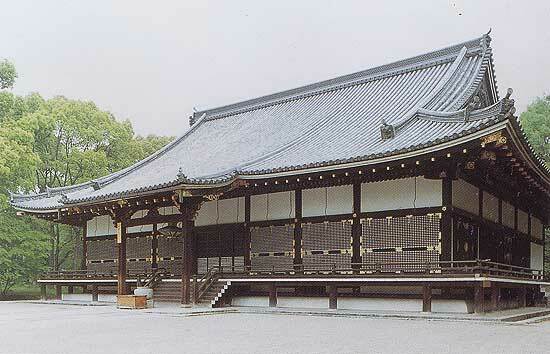 Ninna-ji was destroyed by fire in the Onin war, and was rebuilt between 1641 and 1646. For this restoration, the Shishin-den (main hall for state ceremonies) and the Tsune-goten (private palace) of the imperial palace were relocated to Ninna-ji and became, respectively, the Kondo (main hall) and the Ninna-ji Palace (destroyed by fire in 1888). Other buildings in the temple include the Mie-do which reused the wood of the Seiryo-den of the imperial palace, the Niomon, the Chumon and the Gojunoto (five-storied pagoda). The majority of the temple buildings at Ninna-ji date from this time. Although the original Japanese cypress-bark roof of the large Kondo gave way to a hongawara-buki tiled roof, the building remains the characteristics of palace archuitecture in the Momoyama Period, e.g. enclosing shitomi-do or top-hinged, outswinging windows.